Araya Rasdjarmrearnsook is one of Southeast Asia’s most respected and internationally active contemporary artists, and for the past 30 years, her video, installation, and graphic works have been regularly shown in institutions in her native Thailand and throughout the world. The first major survey of her work in the United States was recently on view at SculptureCenter in New York (2015), featuring an overview of her videos of the past 15 years alongside new sculptural works. She also recently presented a solo exhibition at Tyler Rollins Fine Art, Niranam (2015), which included a wide range of new works, encompassing video, installation, photography, and sculpture. Born in Trad, Thailand, in 1957, Araya received fine art degrees from Silpakorn University in Bangkok in 1986 and from Hochschule für Bildende Künste Braunschweig in 1990 and 1994. Her etchings and aquatints of the late 1980s and early 1990s, with their ghost-like female figures in shadowy environments, set up themes – death, the body, and women’s experience – that would endure throughout her career. 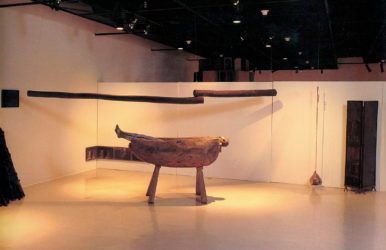 Feelings of loss and isolation, informed by the early death of her mother, and a heightened sensitivity to the strictures traditionally placed on women within Thai society, would increasingly find their expression in her work through the physicality of the body and the concreteness of sculptural installations, which by the early 1990s had become the primary focus of her work. Often incorporating semi-abstract, totemic female forms, natural materials, and haunting photographic imagery, all marked by a patina of age and wear, these installations confront us with the raw physicality of both life and death, charged with an almost animistic power that seems to channel powerful psychological states. 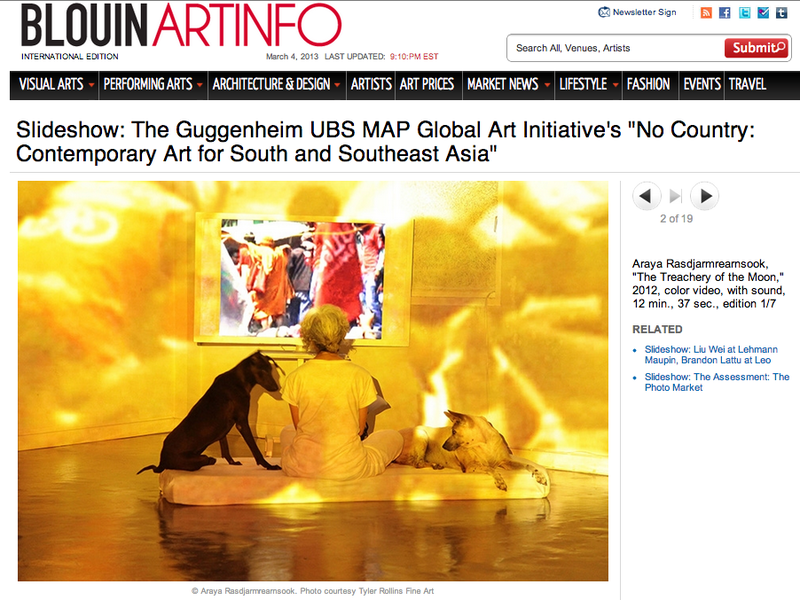 These works were widely shown in such seminal exhibitions as the first Asia-Pacific Triennial in Brisbane, Australia (1993), and Traditions / Tensions: Contemporary Art in Asia, at Asia Society in New York (1996). Living with these often fragile, ephemeral sculptural works in her home, Araya began to examine more closely her relationship with “otherness,” with entities that were radically distinct from her, yet intimately linked by a commonality of experience, a participation in the basic cycles of nature, of life and death. By the late 1990s, this led her to bring rituals of the dead into her artistic practice, and to a shift to video work. In collaboration with the medical community, she began to film her own rituals for the dead at morgues, using corpses of individuals who died without family members to attend them. Incorporating her experience as a teacher (she remains an active member of an art school faculty), as well as her familiarity with Thai ritual practices, she created an extraordinary series of video works evoking the pedagogy of the classroom and the intimacy of private ceremonies, in which she attempts to connect the worlds of the living and the dead. The series was further developed in a residency at Artpace in San Antonio, Texas, in 1998, and had its culmination in a multi-channel video installation for the Thai Pavilion at the 2005 Venice Biennale. 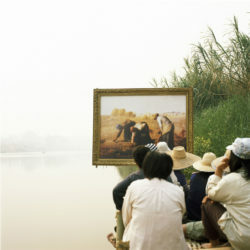 Videos such as The Class (2005) have since been widely exhibited at museums and biennials on four continents. Video has remained the primary medium of Araya’s artistic practice to the present day. Still deeply informed by her earlier sculptural installation work, her videos are imbued with a strong physicality, with a close focus on bodies, often positioned in semi-abstract environments, their aura extending outward into the viewer’s own space. These videos typically imply the presence of an audience that is both observing the action and ceremonially participating in it. They reference traditions of village storytelling, which create continuities between the present and the past, the everyday world and the world of spirits and of legend. Her videos have a meditative, ritualistic quality, and, like many of humanity’s important rituals, they are often centered on the idea of communication between different realms: between the living and the dead, the insane and “normal” people, humans and animals, the worlds of art and “real life.” With her highly acclaimed series Two Planets (2008) and Village and Elsewhere (2011) – shown as part of her first New York solo exhibition in New York (Tyler Rollins Fine Art, 2012) – Araya focused on art itself and the way the viewer interacts with a work of art, placing framed reproductions of iconic Western paintings in rural villages, markets, and Buddhist temples in Thailand, where she filmed groups of farmers discussing the artworks. These videos create a meeting point between apparent oppositions: high art and everyday life; the personal and private spheres; elite and mass culture; art and commerce; East and West. While issues of class and cultural differences, exoticization of the “other,” etc., are invoked, these videos also convey a sense of curiosity, humor, and joy that emphasize a common humanity. Dogs have been a recurring motif in Araya’s work, and indeed dogs are a very important part of her life; she cares for dozens of abandoned, often injured dogs in and near her home in Chiang Mai, Thailand. In an ongoing series of videos and multi-media installations, she explores the interrelationship between humans and dogs, chronicling the daily routines of life, but also suggesting wider themes about overcoming the binarisms of self and object, life and death, human and animal. For her installation project presented at the 2012 edition of Documenta, videos of her interactions with her canine family were screened on the outside of a small cabin in a park, where she and her dog Ngab also lived together for a month. This intimate pairing of the artist’s own body with that of her dogs appears throughout her recent exhibition at the gallery, Niranam. 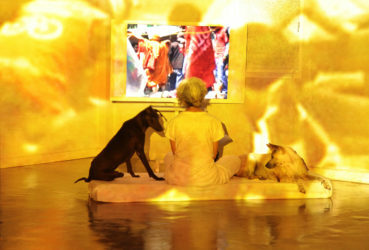 While the Thai title can be translated as “nameless,” in fact the works are highly personal, often featuring images of the artist or the individual dogs she lives with, and are a meditation on ways that the self, one’s body and psyche, exists in a continuum with other living beings (including animals), all participating in the ongoing cycle of life and death. The title Niranam can thus suggest that by delving deep into one’s experience, one can attempt to get at something that is beyond the self, and to a kind of pure experience that transcends the particularities of one’s circumstances, the pain of suffering, and even the apparent finality of death.